Stone Paper Scissors (SPS) is a design studio that creates public art, community collaborations and private commissions. SPS integrates community based art programming with opportunities to re-envision one’s environment for equitable development, engagement in public culture and to promote civic dialogue. 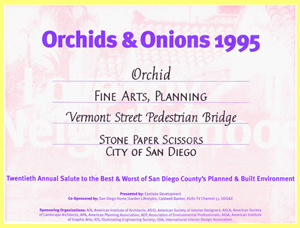 Six Stone Paper Scissors/Art Produce projects have received “Orchid” awards from the San Diego Architectural Foundation and an award for planning from the California chapter of the American Planners Association. 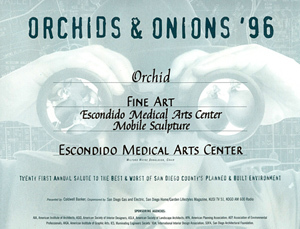 Orchids & Onions is a highly regarded annual acknowledgement of the best and worst of design in and around San Diego. Lynn’s public art commissions range from the design of educational playgrounds and school campuses to sculptural video installations. 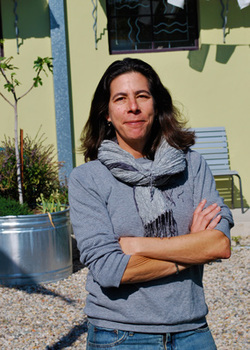 She has exhibited her work at the Athenaeum Arts and Music Library, City Gallery at San Diego City College, Mesa College Art Gallery and was selected the State Assembly District 39 representative for the “California Contemporary Artists 2007” exhibit at the State Capitol in Sacramento. 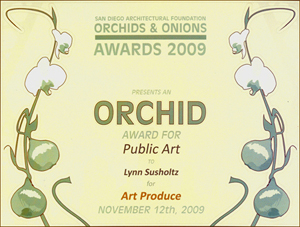 Some of her community engagement work at Art Produce was featured in 2012 issue of Public Art Review, "Food For Thought". ​To see Lynn's newest public project, You Are Home, CLICK HERE. Check out Lynn's interview with Monkeywrench which was broadcast on January 16, 2018 where she discusses artists in communities and being a Citizen Artist. Monkeywrench is a radio program aired on KUCI 88.9 FM in Irvine, UC Irvine's independent, underground radio station. CLICK HERE to listen. 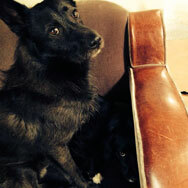 Meet Nino, Kobi and Nijinsky the Art Produce studio dogs!